Community Pharmacy-Based Point-of-Care Testing certificate program provides community pharmacists and members of academia, industry and government with the skills necessary to develop and implement a collaborative testing program for influenza, Group A streptococcus, HIV and hepatitis C. There is a recognized need for community pharmacists to collaboratively improve patient access to care through the use of point-of-care tests. This certificate training program’s 20 hours of continuing education (12 hours of home study and 8 hours of live training) will cover information on the targeted disease state, the physical assessment of a patient presenting to a community pharmacist, point-of-care tests and how to establish a point-of-care testing service. If you are interested in taking this course, please fill out the following interest form. *Non-members: If you join CPhA today, you will receive $100 off of your membership! To take advantage of the new member savings, please contact us at (916) 779-1400. Recognize the need for pharmacist intervention in the community setting to improve patient access to medical care through the use of point-of-care tests. Summarize testing recommendations for influenza, Group A streptococcus, HIV and hepatitis C.
Describe the transmission and pathogenesis of influenza, Group A streptococcus, HIV and hepatitis C.
Identify patients at high-risk for acquiring and experiencing complications related to influenza, Group A streptococcus, HIV and hepatitis C.
Summarize the time course of influenza, Group A streptococcus, HIV and hepatitis C infections. Discuss the management options for a patient with influenza, Group A streptococcus, HIV and hepatitis C infection. List important counseling points for prescription medications used to treat influenza, Group A streptococcus, HIV and hepatitis C infections. List common signs and symptoms of influenza, Group A streptococcus, HIV and hepatitis C infections. Describe the steps involved with the physical assessment of a patient presenting to a community pharmacy with an ongoing infectious disease. Recognize how POC tests differ from the historical “gold standards” for diagnostic testing. Define the terms sensitivity, specificity, positive predictive value and negative predictive value. Describe how POC tests may be utilized in the community pharmacy setting as part of innovative practice models. Explain what it means for a diagnostic test to be CLIA-waived and what is required in order to use CLIA-waived POC tests in the community pharmacy setting. Outline the process and key considerations of making a pharmacy-based infectious diseases management program operational and integrated with existing services. Explain the legal, regulatory and liability issues involved in offering a pharmacy-based infectious diseases management program. Discuss important considerations in documenting, marketing and obtaining compensation for a pharmacy-based infectious diseases management program. Identify measures to track the economic, clinical and humanistic outcomes for a pharmacy-based infectious diseases management program. Identify opportunities for pharmacists to expand their practice in the community setting through the utilization of POC tests. Summarize the prevalence and impact of various infectious diseases, including diabetes, dyslipidemias, influenza, Group A streptococcus, HIV and hepatitis C in the United States. Discuss the value and limitations of various physical assessment procedures, including temperature, pulse, blood pressure, respiratory rate, pulse oximetry and physical inspection. Describe the procedures for conducting a systematic physical assessment and identify normal and critical findings. Interpret physical assessment data and recognize limitations of the data. Demonstrate the ability to appropriately collect a patient’s temperature, pulse, blood pressure, respiratory rate and pulse oximetry. Differentiate influenza, Group A streptococcus, HIV and hepatitis C from other disease states with similar presentations. Discuss the complications associated with influenza, Group A streptococcus, HIV and hepatitis C.
Given a patient case, identify patients that may qualify for pharmacy-based POC testing by a pharmacist versus those that require immediate referral to a physician/provider. Describe the process for collecting patient specimens, including throat swab, nasal swab, oral fluid and whole blood. Demonstrate the ability to correctly collect patient specimens, including throat swab, nasal swab, oral fluid and whole blood. Explain CLIA-waiver and the process for becoming a CLIA-waived site. Recognize the procedures necessary for legal processing of CLIA-waived tests. List at least three risk management techniques to manage liability when conducting CLIA-waived tests. Search statutes and regulations to determine his/her state’s requirements for pharmacist involvement in CLIA-waived testing. Discuss specific strategies for designing and implementing a successful pharmacy-based POC testing program. Explain how to bill for POC testing using the appropriate CPT codes. Document services in a manner appropriate for evaluating patient progress, sufficient for billing purposes, and that facilitates tracking clinical and financial outcomes. Given the performance characteristics of a test (e.g., sensitivity, specificity, percent agreement, etc. ), determine the reliability of the test in a community pharmacy setting. Identify ways for community pharmacists to maximize the reliability of a given diagnostic test. Discuss some limitations to utilizing POC tests in the community pharmacy setting. Recognize common missteps in POC test processing and interpretation that could lead to incorrect results. List the steps a pharmacy can take to ensure compliance with Good Laboratory Practice (GLP) standards. Identify clinically unstable patients who should be immediately referred to the appropriate source of care. Provided a patient scenario, make recommendations for the use of POC tests. Collaboratively develop a patient care plan based on medical history, physical assessment data and results of POC tests. The National Association of Chain Drug Stores is accredited by the Accreditation Council for Pharmacy Education as a provider of continuing pharmacy education. Practice-based Community Pharmacy-Based Point-of-Care Testing Certificate ACPE University Activity #0206-9999-15-012-B04-P. Initial Release Date: 1/08/2015; Expiration Date: 1/08/2018. Continuing pharmacy education (CPE) credit will be awarded for the certificate training course only. This is a practice-based activity and is primarily constructed to instill, expand or enhance practice competencies through the systematic achievement of specified knowledge, skills, attitudes and performance behaviors. Successful completion of the live seminar component involves passing the final exam with a grade of 70 percent or higher and demonstrating proficiency in diagnostic testing techniques. Successful completion of this component will result in 8.0 contact hours of continuing pharmacy education credit. Successful completion of the self-study component involves passing the self-study assessment questions with a grade of 70 percent or higher and will result in 12.0 contact hours of continuing pharmacy education. Attendance and participation are required before obtaining CPE credit. Partial credit will not be awarded. CPE Monitor, a national, collaborative effort by ACPE and the National Association of Boards of Pharmacy (NABP) to provide an electronic system for pharmacists to track their completed PCE credits, went into effect on Jan. 1, 2013. NACDS, as an ACPE-accredited provider, is required to report pharmacist CPE credit using this new tracking system. Pharmacist participants must provide their NABP e-Profile identification number and date of birth (in MMDD format) when they register for a CPE activity. It will be the responsibility of the pharmacist to provide the correct information (i.e., e-Profile identification number and date of birth in MMDD format). If this information is not provided, NABP and ACPE prohibit NACDS from issuing CPE credit. 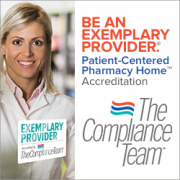 Online access to their inventory of completed credits will allow pharmacists to easily monitor their compliance with CPE requirements and print statements of credit. Therefore, NACDS will not provide printed statements of credit to pharmacists. If you have not signed up for CPE Monitor, please go to MyCPEMonitor.net.